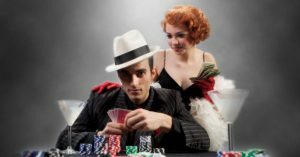 UC’s CCM is staging a vibrant, lively version of a Golden Age Musical classic, “Guys and Dolls,” with a talented ensemble, creative team, and amazing orchestra creating quite a few memorable standout numbers. Music and Lyrics by Frank Loesser, Book by Jo Swerling and Abe Burrows, “Guys and Dolls” runs through October 27. It takes a while to build, but the payoff is in the second act, when the talent keeps coming. Based on Damon Runyon’s colorful stories of 1940’s New York city characters, the play revolves around the antics of gambler Nathan Detroit (the role is double cast: Matt Copley opened the run, but alternates with Kevin Chlapecka) and his long-time fiancé Miss Adelaide (also double cast, I saw Anya Axel, but Kendall McCarthy alternates). Detroit and his cronies plan illegal “floating craps games” while dancer Adelaide is more than ready to ready to settle down after a 14-year engagement. The other unlikely couple is gambler Sky Masterson (Frankie Thams) who bets he can take Mission Sister Sarah Brown (Aria Braswell) to dinner in Cuba. He wins the bet but loses his heart. All are capable performers with some great individual moments. During “Sue Me” between Nathan and Adelaide, “If I Were a Bell” between Sarah and Sky, and Sky’s “Luck be a Lady” the performers all get a chance to let go and belt out their hearts. If you’ve seen (or been in) high school or community theatre production of “Guys and Dolls,” you have probably not been privy to the richness of dancing and choreography this CCM version provides. You will be impressed with the chorus, from when they first step on stage with unique characters in the stylized street scenes, to the well-executed and varied dances in the Havana scenes, to the Crapshooters Ballet which features so much enthusiastic dancing and acrobatics from the young cast it reminded me of “Newsies.” When you think they’ve topped it, here comes “Sit Down You’re Rocking the Boat,” with masterful precision by the group that really understands movement, being led by the triple threat of Nick Berninger as Nicely Nicely Johnson, with professional comedic timing and delivery. He knows how to punch the jokes. Director Diane Lala managed a lot of moving pieces, and as choreographer, she fills the stage with dancers and movers that are a joy to watch. The ensemble is amazing. Kudos for casting an alumnus as Arvide Abernathy, Sarah’s father. His “More I Cannot Wish You” was sweet and believable. The color pallet of the costumes and scenery is interesting and enjoyable. Thomas C. Umfrid (Scenic Designer) planned wonderful moving pieces that adapt and impress in every scene. The interior of the Mission is a warm authentic treat, but the lightpost is perfect. Costumer Designer Reba Senske’s clothing fit the performers and the period, with lightness and ease, accommodating the hundreds of high kicks throughout. The show is not without some issues. Audience comments at intermission concerned articulation and sound issues during the speaking segments (from patrons in their 20s to 70s, sitting in various parts of the theatre). However, the music can be heard, both from the amazing singers and the talented orchestra, conducted by Roger Grodsky. “Guys and Dolls” runs through October 27. Contact CCM.uc.edu or 513-556-4183 for tickets and more information. This was written by Sheldon Polonsky. Posted on Sunday, October 21, 2018, at 4:09 pm. Filed under Stage Insights News, Stage Insights Reviews. Bookmark the permalink. Follow comments here with the RSS feed. Comments are closed, but you can leave a trackback.